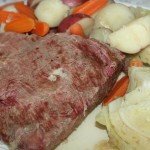 So maybe corned beef and cabbage really didn’t originate in Ireland, however, it has become a meal time tradition on St. Patrick’s Day here in America. And if you are wondering about what the term corned beef means, don’t be fooled, it doesn’t have anything to do with corn. The term comes from the how the meat is cured. 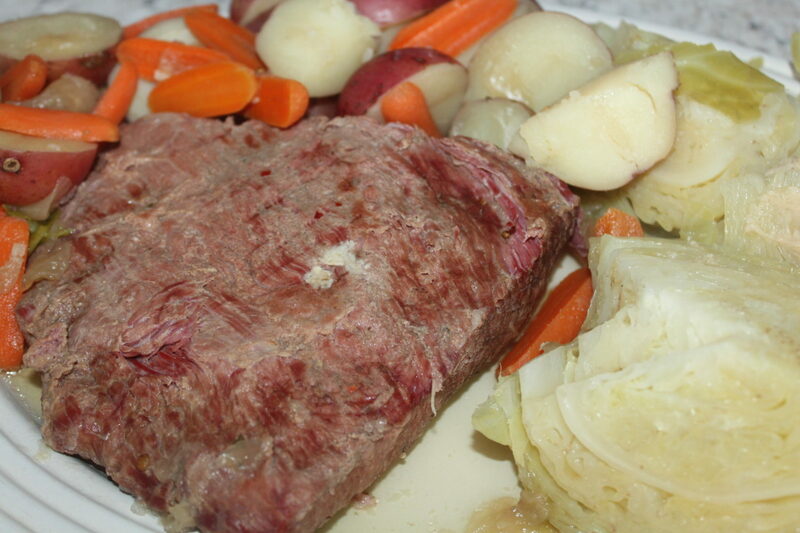 The technique traditionally used included large grains of rock salt, aka ‘corns’, which then resulted in the term corned beef. We love to cook corned beef in the slow cooker all day. Although this year, I’ve also included the instructions for the Instant Pot/Pressure Cooker users. Both cooking techniques will result in fall apart corned beef and cabbage which will have everyone begging for more, especially when served with Irish Soda Bread. If you are lucky enough to have leftovers, the corned beef makes delicious Reuben sandwiches the next day! 1. 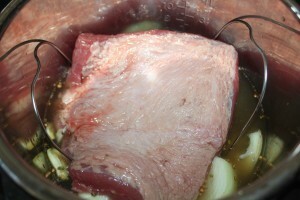 Rinse the corned beef under cold water to remove excess salt and any gel that has formed. 2. Place the carrots, potatoes, and onion into the bottom of a slow cooker, pour in the water, and place the brisket on top of the vegetables, fat side up. Sprinkle on the spices from the packet, cover, and set the cooker on High. 3. Cook the brisket for about 8 hours. An hour before serving, stir in the cabbage and cook for 1 more hour. 2. Put the seasoning packet, broth, onion and garlic in the pressure cooker. Put the rack in the pressure pot. Place corned beef on rack with the fat side up. 3. Lock the lid in place and set the valve on sealing. Select High Pressure (or Meat) and set the timer for 90 minutes. When beep sounds, turn off pressure cooker. Use a natural pressure release for 10 minutes, and then do a quick pressure release to release any remaining pressure. When valve drops carefully remove lid. 4. Using silicone gloves, remove the rack and brisket and place on a plate. Cover the corned beef with aluminum foil until ready to serve. 5. Add the potatoes and carrots to the broth and place cabbage wedges on top. Lock the lid in place. Select High Pressure and set the timer for 5 minutes. Quick pressure release. Remove from broth and serve with the corned beef. *Hint, add broth over top of the beef and vegetables for an extra moist meal. Rinse the corned beef under cold water to remove excess salt and any gel that has formed. Place the carrots, potatoes, and onion into the bottom of a slow cooker, pour in the water, and place the brisket on top of the vegetables, fat side up. Sprinkle on the spices from the packet, cover, and set the cooker on High. Cook the brisket for about 8 hours. An hour before serving, stir in the cabbage and cook for 1 more hour. Put the seasoning packet, broth, onion and garlic in the pressure cooker. Put the rack in the pressure pot. Place corned beef on rack with the fat side up. Lock the lid in place and set the valve on sealing. Select High Pressure (or Meat) and set the timer for 90 minutes. When beep sounds, turn off pressure cooker. Use a natural pressure release for 10 minutes, and then do a quick pressure release to release any remaining pressure. When valve drops carefully remove lid. Using silicone gloves, remove the rack and brisket and place on a plate. Cover the corned beef with aluminum foil until ready to serve. Add the potatoes and carrots to the broth and place cabbage wedges on top. Lock the lid in place. Select High Pressure and set the timer for 5 minutes. Quick pressure release. Remove from broth and serve with the corned beef. Hint, add broth over top of the beef and vegetables for an extra moist meal. Thank you Zenda! I am glad you enjoyed it. I made this recipe in my crockpot last night and it was great! Thank you so much for sharing it. It will be definitely be added to my recipe box! Hi Yvonne We bought our Corned Beef at our local grocery store. It is a beef brisket that has been cured with salt. The seasoning packet comes standard in the package with the beef. I used 4 cups of chicken broth for the pressure cooker, but you could substitute that with beef broth or even water if you wanted to. Hope this helps! Thank you! We used 4 cups of chicken broth, but you could use beef broth or even water. What is a 3-4 flat cut cornered Brisket? How much water needed for Pressure cooker. Where does one get the seasoning packet or otherwise what is in the Seasoning Packet and how much of each ingredient? I love your recipes! How much water do you need for this one?